English illustrator and caracaturist who worked for more than 50 years as a principal cartoonist for Punch. 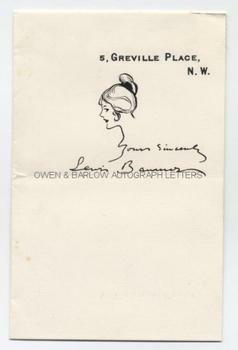 A fine full AUTOGRAPH signature on his 5 Greville Place headed notepaper, with the words "yours sincerely" and incorporating a charming original ink drawing of a fashionable young lady in profile. 12mo. Approx 6.25 x 4 inches. With an integral blank leaf. Slight mounting traces to verso of top edge of integral blank, else fine.